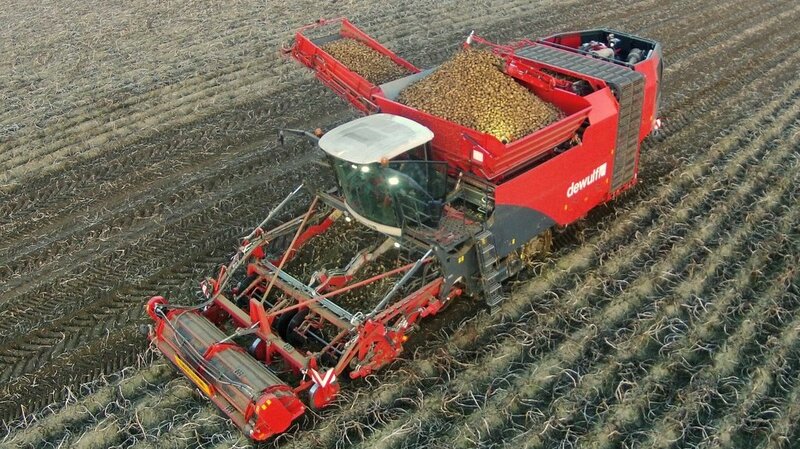 Now able to lift an extra row, up to four 90cm rows or two 180cm beds, Dewulf has updated its Kwatro self-propelled potato harvester. Richard comes from a family dairy farm on the Fylde Coast in Lancashire. Are new potato varieties delivering improvements? Harvesting is done forward of the tracks to reduce crop damage. Keeping the 29,500kg monster light on its feet are 900mm (18in) wide Claas TerraTrac units, with a 1055R32 or an optional 1250R32 single tyre bringing up the rear. Tight turns for the 15m long harvester are achieved by a maximum lock of 60 degrees on the rear wheel. Aiming to reduce crop damage, the two harvesting lines are positioned forward of the tracks. Each line consists of one digging and two sieving webs and both maintain the same 176cm width through to the ring elevator. The manufacturer says this is unique in a four-row harvester, and allows the machine to achieve higher working speeds of up to 9kph. Crop is evenly distributed onto the 1.2m wide ring elevator, which features active side plates to reduce the chance of damage when moving the crop into the 17.5cu.m, automatic filling bunker.